The split jerk has been around pretty much since the beginning of weightlifting. It goes without saying that the split jerk consists of ”throwing” the bar above head (while using a clean grip, but different grip width have been used), while simultaneously throwing the feet in a split position which allows for a fast descent under the bar, and ultimately allows for a proper catch. You actually use the momentum induced on the bar to propel -or to push yourself- yourself in the receiving position.The jerk is the lift that is the most often missed in competition so a review of the jerk seems important. The benefits of using the split jerk are many. The split position makes for a very stable base as it makes the base of support large. We consider that high stability is possible if the base of support is large and if the center of gravity is low. For stability to be maximal, the center of gravity has to be in the middle of the base of support. The split jerk offer just that. The foot positioning makes the base of support very large and, as long as the torso descend under the bar in a very vertical line, the center of gravity is going to be right in the middle of the base of support. In contrast, the power jerk and the squat jerk, whom consist of catching the bar in a squat stance, offers a very small base of support. Also, in the case of the power jerk, the center of gravity is fairly high. The center of gravity, if the jerk is well executed, will be in the middle of the base of support. However, due to the small size of base of support, the center of gravity will still be close to the outside of the base. This is why lifters like Pyrros Dimas always took a few step forward when catching the Jerk. He needed to do that in order to stabilize the lift. If we look closely at Figure 1, we can see that the split jerk offers better stability, especially in the antero-posterior axis (front/back). 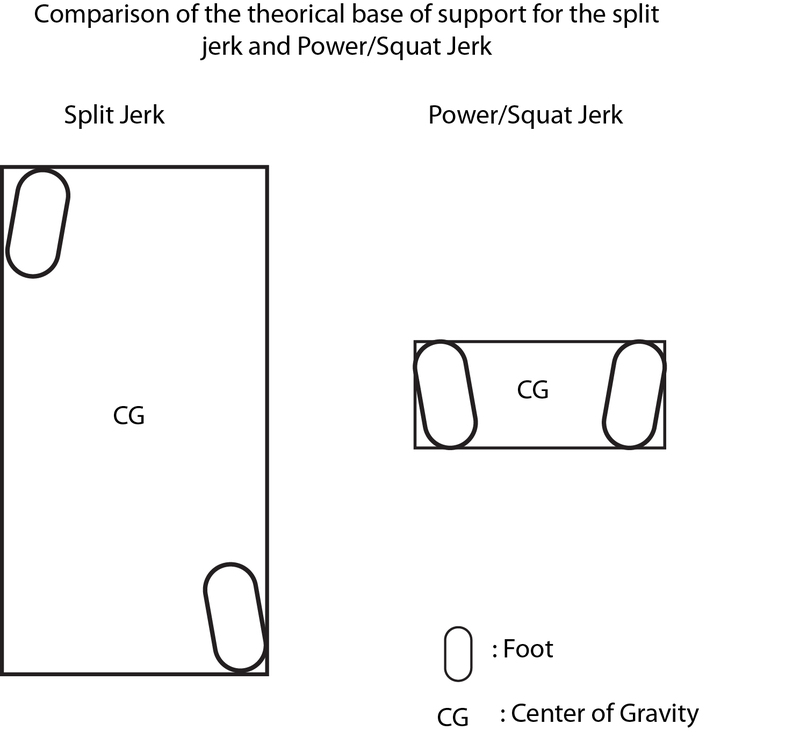 However, even thought the base of support of the split jerk offers better lateral (Left/right) stability in comparison to the power jerk, it is still limited which is why you will sometimes see a lifter take a step to the side during the lift or its recovery. This brings us to the next point : if the split jerk offers great antero-posterior stability and medium lateral stability, than it becomes apparent that lateral chain of muscles, especially in the trunk are key the lifts. The oblique muscles, the lattissimus dorsis and even the erector muscles of one side of the body become greatly solicited if the center of gravity of the lifter and barbell travels to the opposite side. Of course, other stabilizing muscles, such as the transverse abdominis and rectus abdominis, have to work even harder. It becomes apparent that the Jerk involves a great deal of core strength. Core strength, in this case, is defined as trunk strength. By nature, the foot position makes the lifter recruit the muscles of his legs differently from one another. Although the quadriceps of the back leg are preventing the excessive bend of the knee, it is generally accepted that the quadriceps of the front leg are more loaded (especially since the proper execution of the split jerk calls for the front leg to come back first to the middle line, and then the right leg comes back). There will also be differential recruiting of the hip muscle. The glutes on the side of the back leg will be more recruited than on the front leg side. The hip flexors, however, will be more recruited on the front leg side. The hamstring will be recruited differently, similar to the glutes. The asymetric recruitement of the lower limbs is prone to cause problems (read : muscle imbalance) as the lifter always throw the same leg forward. We can usually see a slight rotation of the hip as well as better hip flexors flexibility on the side of the back leg. This happens over time and becomes more apparent with bigger weights. It does not mean that the split jerk is structurally bad, either. Given this reality, and because the goal of the lifter is always to stay healthy, it becomes apparent that single leg exercises are important for the lifter that use the split jerk. Lunges, step ups, single leg deadlifts, romanian deadlifts, etc, are exercises that can ensure that the lifters do not develop muscles imbalances. More importantly, these exercises will actually improve the stability of the jerk. As mentioned earlier, core strength, especially in the lateral axis, is also very important for the split jerk. Exercises like side planks, side bends, and rotation work will work well in helping the lifters stabilize the bar overhead. I do not state that the power jerk should not be used. It just seems like the split jerk is more stable and the only cons that come with it are manageable via proper programming. I am going to post a link to this article on our Crossfit Zone blog page. Found this while looking for how to properly teach this move for a class in grad school. I’ve performed the split jerk before but after reading this realized I was not finishing correctly. Great article, along with “Fixing your Split Jerk”.